“Aung San Suu Kyii would like to help the Bengali, but I block her,” says Ashin Wirathu with some pride. 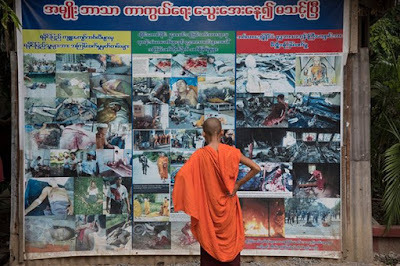 Branded the “Face of Buddhist Terror” by Time magazine, Wirathu has his own compound within the Masoeyein monastery in Mandalay. Before being offered a comfortable chair, visitors are greeted by a wall of bloody and gruesome photographs. The pictures show machete-inflicted head wounds and severed limbs, disfigured faces and slashed bodies; Wirathu claims, without the slightest evidence, that the images are of Buddhists who were attacked by Muslims. Next to the display, under which a monk is methodically sweeping the floor, stands a long table. The newspapers spread across it confirm that, for Wirathu’s followers, daily reading is a matter not just of spiritual texts but also of politics. An orange-robed assistant adjusts a film camera on to a tripod; another brandishes a Nikon fitted with a large zoom lens. This interview will be carefully recorded by the monks in every way. Wirathu is a man of unassuming features. His baby face belies the power he holds over nationalist activists in Myanmar as the spiritual leader of the 969 movement and head of Ma Ba Tha, the Organisation for the Protection of Race and Religion. Wirathu perches on one of two teak armchairs; the wall to his left is covered with poster-sized photographs of him. He stands accused of inciting violence against the minority Muslim population in Myanmar, where racial and religious faultlines are increasingly exposed. In 2012, fuelled by his speeches, riots erupted in Meiktila, a city in central Myanmar, leaving a mosque burned to the ground and over a hundred dead. In a soft and measured voice, Wirathu claims his speeches are neither “hate” nor racist, but serve merely as a warning to protect his people. What people make of those warnings is not his doing, he says calmly. 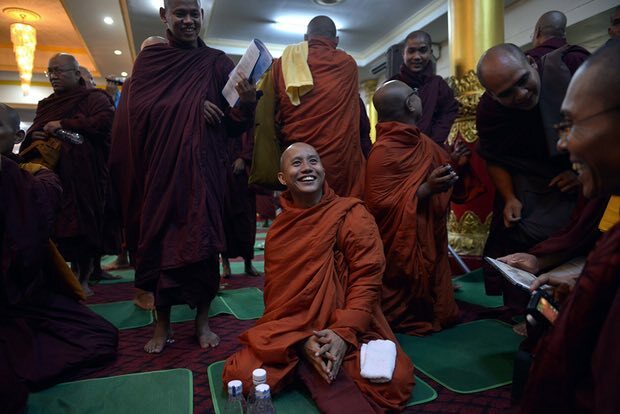 Wirathu speaks of protecting his flock – “his beloved” – against what he perceives as danger. His denial of responsibility for the violence that has followed his sermons contrasts with eyewitness accounts of knife-wielding monks, denim jeans visible under their robes, leaving Wirathu’s monastery during the Mandalay riots of 2013. Wirathu points to four soldiers marching through the compound, joking that they are there to arrest him, again. In 2003, he was sentenced to 25 years in prison for his anti-islamic sermons, but was released nine years later. In the event, the soldiers are there simply to make donations to his cause. 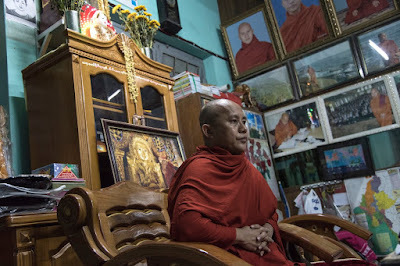 Wirathu is confident that the power of Ma Ba Tha is far from dwindling; that the organisation represents Myanmar Buddhism and its influence over the government is entrenched.